The Dornier Museum, which has been opened in Friedrichshafen in 2009, documents the company’s one hundred years of pioneering spirit and moreover, the history of air and space flight in its political, economic and social context. From the museum’s foyer a path leads to the gallery, the so-called museum box, the centrepiece of the exhibition. Here the visitor delves into the world of the flight pioneer Claude Dornier with the help of a 270° collage consisting of historic film material. 6 chronological showcases that exhibit model airplanes are at the starting point of the museum tour. At the backside of the show cases the visitors can watch related film sequences. 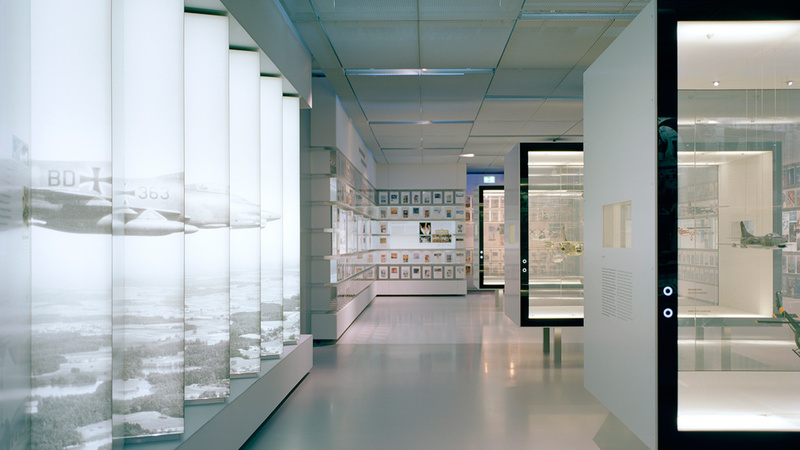 Further interactive media like the swivelling radar table, a digital library with a complete collection of the Dornier journal »Do-Post«, or medial display cabinets that provide a prospect into space constitute the didactical as well as emotional foundation of the exhibition.